The site of the 1940s Grange Kitchen originally served as the woodshed for the 1957 John J. Morrill store. In the 1940s the Grange activities were so popular that creating a funcitonal kitchen became essential to serving multitudes during Grange suppers. A six and a half foot long copper sink with two sets of faucets was key to food preparation and clean up, as was extensive counter space with storage below for large cooking pots. 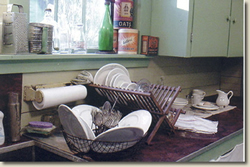 Wall cabinets were built for storage of dishes. The availability of electricity meant that an electric stove and an electric refrigerator could be used. A pass-through area facilitated serving Grange suppers in the Grange dining room (formerly the main room of the store). The green paint of the walls and cabinets and the red linoleum counter tops still echo the 1940s. A vintage dish drainer set on the red linoleum counter top next to the copper sink and below the high windows sill portray a snapshot of a bygone era when the Grange flourished in Gilford.